A research team from the University of the West of England, working in partnership with a laboratory in Delhi, a fair trade company, a community-based organisation and an environmental research institute in Himachal Pradesh in the Western Himalaya, have jointly been awarded a 2008 SEED award for their project investigating Himalayan oregano essential oil as an antibacterial agent for MRSA. The project is part of an initiative to provide rural communities with sources of income generated from sustainable collection of non-timber forest products in the Kullu District of Himachal Pradesh. Origanum vulgare is a relatively common herb that grows in high altitude meadows throughout the Himalayan region, yet it is perceived by many villagers to have no culinary, medicinal or economic value. In Kullu oregano is often referred to as 'bekaar gahaas', or 'useless grass'; even cows and goats don't eat it. Recent research by UWE in the UK and SGS in Delhi has shown that the essential oil of Himalayan oregano oil contains potent antibacterial properties and is very effective at killing the hospital superbug MRSA. These findings have presented a valuable opportunity to develop a range of antibacterial products that would provide a sustainable source of income to rural communities in the Himalaya, and at the same time introduce an environmentally friendly means of helping to prevent the spread of MRSA in hospitals in the UK. The SEED Initiative is an international programme backed by the UN that promotes and supports entrepreneurial partnerships that develop innovative, locally led solutions to the global challenges of sustainable development. The SEED awards provide backing to projects that are in an early stage of development and have high potential for growth and replication. 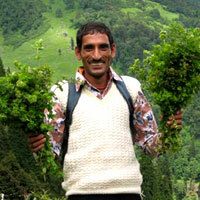 The Himalayan Oregano project was one of five winners selected from over 400 global applications. Achim Steiner, the Executive Director of UNEP, said of the 2008 awards: "The SEED Awards again underline that creative and entrepreneurial solutions to many of the pressing challenges facing the world are being found. It is now vital that these shining examples are federated and mainstreamed across communities and countries to maximize their undoubted and potentially significant impact." One of the lead partners of the project in India, Biolaya Organics, is a company that is developing projects aimed at conserving endangered medicinal herbs, both by cultivating threatened species, and by providing alternative sources of income to herb collectors through sustainable collection and value addition of more common species such as oregano. Ben Heron from Biolaya Organics explains, “We started working with oregano because it is a species that, if managed properly, can be collected year after year without depleting the population in the wild. Our aim is to be able to pay the local herb collectors the equivalent amount that they would normally earn from collecting endangered medicinal herb species so that they become less dependent on the extraction of these plants for their livelihoods. “It has been known for some time that Mediterranean oregano oil is a powerful antimicrobial, which is said to be due to the high content of a compound called carvacol. As far as we know nobody has tested the carvacol content of Himalayan oregano oil before, so we teamed up with SGS in Delhi to conduct tests and found that it was equally as potent as the Mediterranean variety. UWE's project leader Professor Vyv Salisbury and co-investigator Dr Shona Nelson are very excited at the opportunity to help the community. Vyv said, “We have done a few preliminary tests and have found that the essential oil from the oregano kills MRSA at a dilution 1 to 1,000. The tests show that the oil kills MRSA both as a liquid and as a vapour and its antimicrobial activity is not diminished by heating in boiling water. This is exciting as it also means that we could consider using the oil to develop disinfectant washing powders. We now aim to conduct a focused academic study in partnership with SGS labs in Delhi that we hope will give the project the academic credence needed to market the oil. The SEED award will be presented to the team at the SEED award conference on Monday 17 November, at the German Embassy in Delhi by the German Minister of Environment, Sigmar Gabriel.